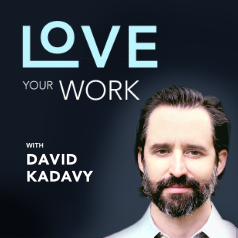 David Allen Podcast Interview: Clearing the space for creative work. Almost 15 years ago, Getting Things Done started taking the internet by storm. Techies started buying binder clips and index cards in bulk. Today, “next actions” and “contexts” are commonplace in teams around the world. Just about everyone knows GTD stands for Getting Things Done. When I was trying to deal with wearing multiple hats as a designer in an architecture firm, I absorbed some GTD through osmosis to get on top of my daily tasks. A few years later, when I finally listened to the audiobook for GTD, I could feel my brain being rearchitected. I captured everything that was on my mind, and developed a habit of doing a “weekly review.” Suddenly, my creative energy was unleashed. And so was my energy for thinking about the bigger picture, like what I wanted out of my life and my career. Millions of people have been impacted by GTD in this way. It’s all thanks to our guest today. After more than 20 years as a productivity consultant, David Allen (@gtdguy) finally put his knowledge into book form with Getting Things Done, which came out in 2001. Since then, he’s taken GTD global, with certified GTD consultants all over the world. One of his top people even lives not too far from me down in Colombia. Here’s what we’ll talk about in this conversation. GTD helps clear the space in your head for creative work, but what about actually getting creative work done? We’ll learn how David used GTD to actually write Getting Things Done. GTD also helps clear your mind for making big life decisions. How did David use GTD to decide to move from the US to Amsterdam a few years ago. GTD suggests a lot of paper for keeping track of things. What does David think about digital management of GTD? SendPro: Print stamps and shipping labels straight from your computer – at discounted prices, with SendPro, from Pitney Bowes. Try SendPro FREE for 90 days at http://pb.com/loveyourwork. Pistol Lake: Ultra-functional apparel for minimalists. Get 10% off and a 100-day free trial of Pistol Lake apparel at http://pistollake.com/loveyourwork. Use the code LOVEYOURWORK at checkout.